My years-long streak of bad luck with Vegetarian Times recipes seems to have finally broken. I had some chickpeas in the freezer and was looking for something to do with them when I ran across this reader recipe I had torn out of the magazine back in 2011. I had everything on hand except for the greens so I grabbed some Swiss Chard at the store and was ready to go. This cooks up pretty quickly and makes a satisfying lunch or dinner. And you can add it to your repertoire of workday lunches, as it also travels well. As usual, if you do not have the spices required, you can easily substitute with an equal amount of curry powder (which is what the original recipes calls for, so you won't even be cheating). Heat oil in saucepan over medium-high heat. Add cumin and mustard seeds and cook for about 30 seconds, until the mustard seeds start popping. Add the onions, garlic and ginger and cook for 2 minutes, then add the jalapeno and chard stems and continue cook, stirring, until the onions have started to brown. Add the spices and cook for 1 minute to release the spices, then add the tomato and cook for 2 to 3 minutes, until the tomatoes begin to soften. Add the chickpeas, coconut milk, and broth and bring to a boil. Turn the heat down to low and simmer for 30 minutes. Add the chard leaves and coconut milk and cook until the chard leaves have wilted, 5 to 10 more minutes. 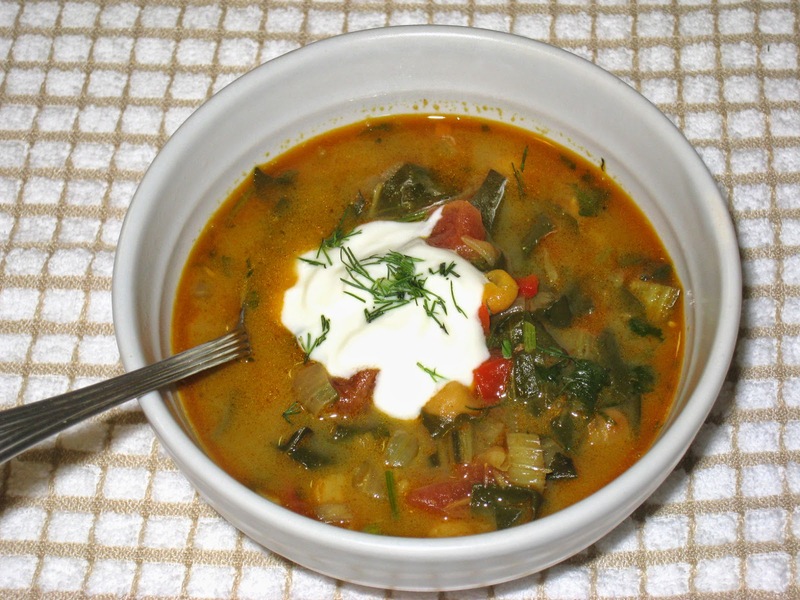 Add the cilantro and dill if using and serve garnished with the yogurt and more cilantro and dill, if desired.